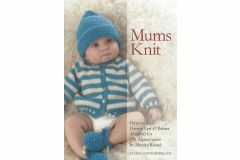 Patterns for Grown Ups and Babies designed for UK Alpaca yarns by Monica Russel. UK Alpaca’s first knitting pattern book encompasses separates for adults, and amazing cardigan showing off the range of colours in our double knit yarns and four sweet baby sets. A total of 23 patterns and a short article all about alpacas.